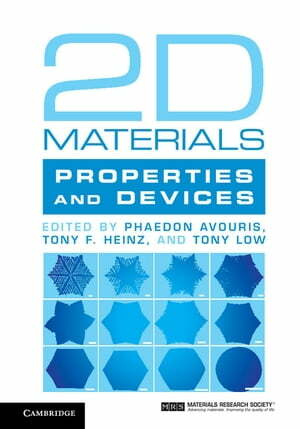 Collins Booksellers - 2D Materials by Phaedon Avouris, Tony F. Heinz & Tony Low, 9781316732342. Buy this book online. Learn about the most recent advances in 2D materials with this comprehensive and accessible text. Providing all the necessary materials science and physics background, leading experts discuss the fundamental properties of a wide range of 2D materials, and their potential applications in electronic, optoelectronic and photonic devices. Several important classes of materials are covered, from more established ones such as graphene, hexagonal boron nitride, and transition metal dichalcogenides, to new and emerging materials such as black phosphorus, silicene, and germanene. Readers will gain an in-depth understanding of the electronic structure and optical, thermal, mechanical, vibrational, spin and plasmonic properties of each material, as well as the different techniques that can be used for their synthesis. Presenting a unified perspective on 2D materials, this is an excellent resource for graduate students, researchers and practitioners working in nanotechnology, nanoelectronics, nanophotonics, condensed matter physics, and chemistry.